It is officially October and it only means one thing: Halloween. If you are attending any festivities this month and need a dessert to bring, then try out the Reeces Pieces Blondie. It has everything that we love; chocolate, peanut butter and of course, the blondie. We all know the infamous White Chocolate Brownie at Moxies, well this is similar but kicked up a notch. Because, who doesn't love Reeces Pieces? This simple and quick recipe will have you wanting seconds and thirds and quite possible never baking brownies again. 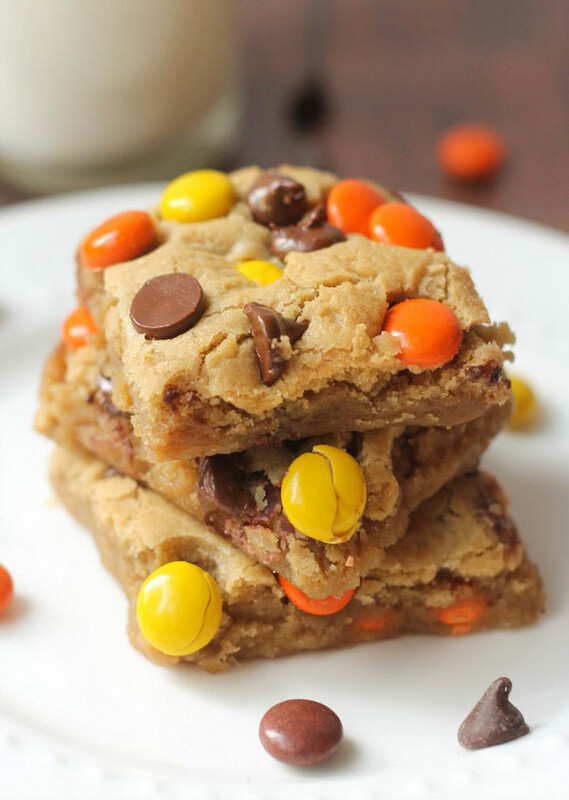 Brownies are out, Blondies are in! In a large bowl, combine butter and brown sugar. Add the peanut butter and stir to combine. Mix in the eggs and vanilla. Stir well. In a separate bowl, combine all dry ingredients. Stir into the batter. Pour in the Reeses Pieces and chocolate chips. Gently mix. Evenly spread batter into a greased 9x13 pan. Bake at 350 for about 30 min or until an inserted toothpick comes out clean. Allow to cool. If you are not a peanut butter fan then add chocolate chips or M&M's to the bowl instead. There are always ways to change up the recipe but given that it is Halloween season, the Reeces Pieces tie in nicely!